Simplify your inventory and order operations for your growing business. A free 14 day trial is just one click away from you. China’s highly developed eCommerce market offers valuable insights into the future of online shopping globally and what it will take for retailers to succeed. Since 2010, China’s eCommerce market has developed at an accelerated pace in line with an increase in disposable income and consumption across the country. As a result, their online marketplace is now more advanced than any other nation in the world, and eCommerce businesses have to constantly adapt to rapidly changing consumer demands. In an intensely competitive environment, Chinese retail brands are forced to experiment and respond to shifting consumer demands and market conditions quickly. 50% of Chinese consumers use social media such as WeChat to do product research or find recommendation, making it a powerful tool for influence online purchasing decisions. 71% of consumers in China are already using online-to-offline (O2O) services (such as click-and-collect services), and of those, 97% say they will use the same or more in the coming six months. 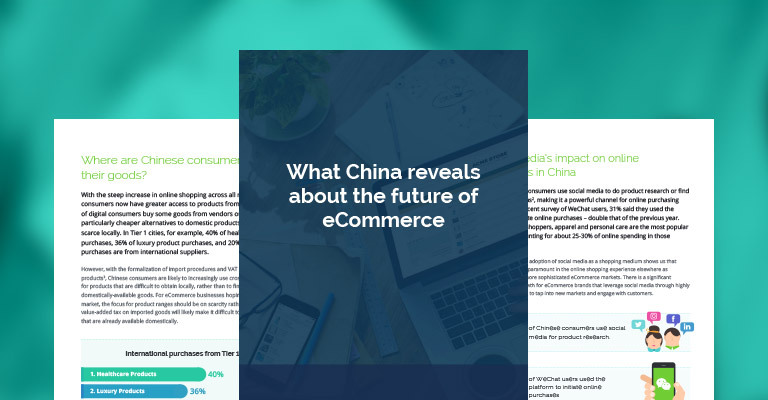 Want to dsicover more insights on online shopping in China, including consumer habits, buying decisions, and what the implications are for eCommerce retailers worldwide moving forward? Download your FREE Future of eCommerce eBook today! Please complete this quick form in order to download our eBook. We will never divulge your details to third parties!